A series of webinar produced by Akamai Technologies featuring IDC Financial Insights. Webinars will explore topics such as mobile, web secruity, and website performance. Mobile services will only continue to grow if they are fast, secure and convenient. Distributed Denial of Service (DDoS) attacks have disrupted mobile financial services and are just one type of attack that deserves high priority attention. During this webinar, IDC highlights mobile security solutions that reconcile risk, user experience, and timely threat response. IDC will illustrate these best practices with examples. 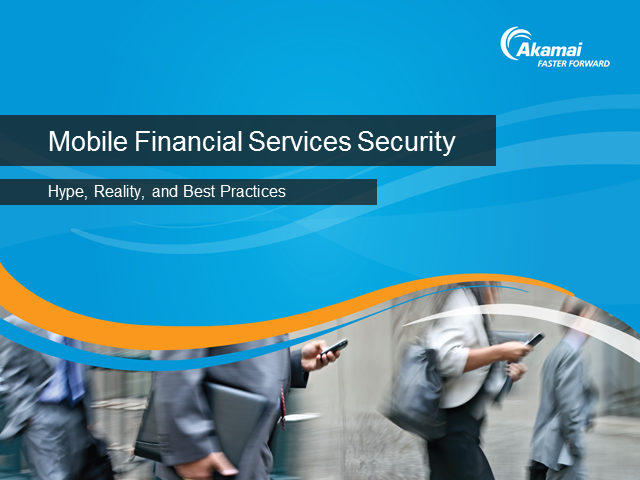 Then, security and performance experts at Akamai Technologies will explore case studies that demonstrate how leading financial firms are addressing mobile security and performance challenges. In financial services, even fractions of seconds in response time affect conversion to revenue and customer satisfaction. Mobile financial services response times, which average more than 10 seconds (Keynote’s Mobile Benchmark for top Financial Firms), are not meeting customer expectations. Furthermore, fast services only matter if they are also secure and available, and mobile financial services have been disrupted by the growing onslaught of DDoS attacks. In this webinar IDC Financial Insights will examine the best practices of leaders in mobile financial services. Then, performance and security experts at Akamai Technologies will explore case studies that demonstrate how leading firms are addressing mobile performance and security challenges.